AUGUST 1, 2016 – Latitude 33 Aviation was recently recognized as San Diego’s Best Air Charter company by Ranch & Coast Magazine’s 2016 Reader’s Poll. We are honored to receive this award and appreciate the support of our clients, partners and friends in the local community. The Reader’s Poll selects the premier businesses in the area and ranks Latitude 33 Aviation alongside other notable brands such as Nordstrom, Ralph Lauren, Hotel del Coronado, Rancho Valencia Resort & Spa, Hoehn Motors, Scripps and Torrey Pines Golf Course. Operating the largest and newest fleet of light jets in the Western U.S. means we have the capacity to take our clients wherever they need to be. We look forward to another fantastic year providing the best in private travel services. Ranch & Coast Magazine’s Best of San Diego Reader’s Poll is an annual award provided to the best companies in the area as selected by readers and patrons. 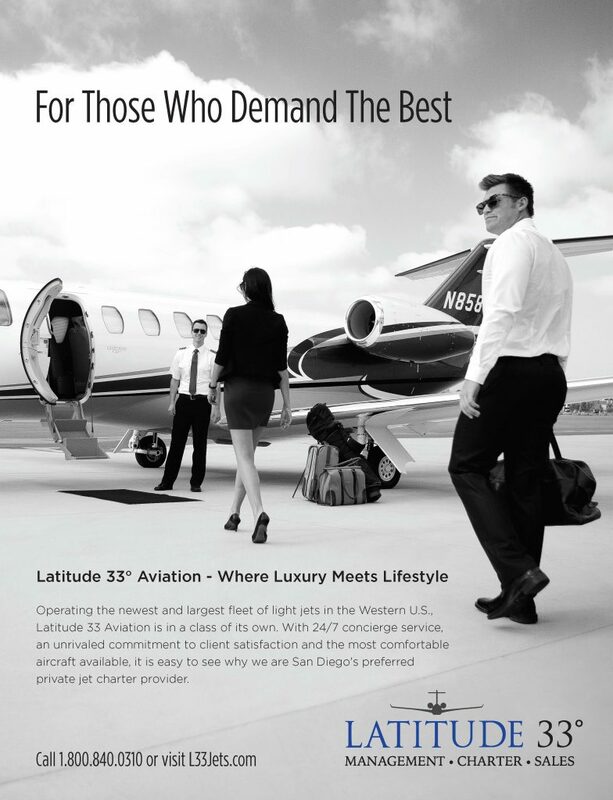 See Latitude 33 Aviation’s back cover advertisement in the 2016 Best of San Diego edition here.